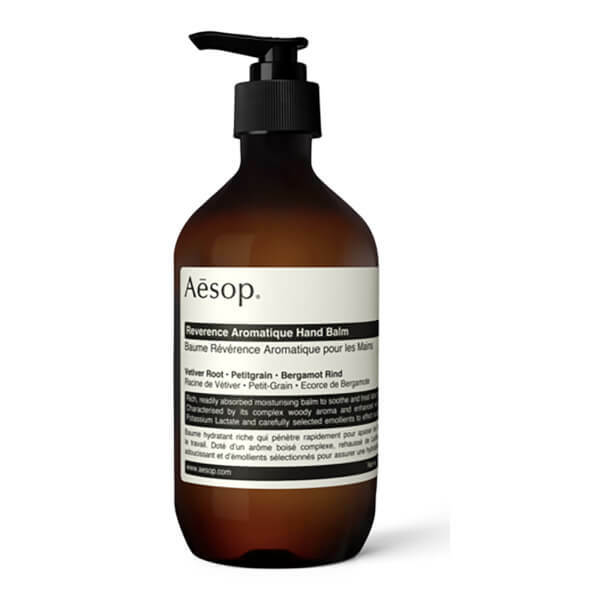 Aesop Reverence Aromatique Hand Balm 500ml provides immediate, intense rehydration for dry, work-weary hands, leaving skin supple and supremely soft. Specially created for hands suffering extreme dryness, Aesop Reverence Aromatique contains carefully selected emollients along with natural hydration promoters to revitalise tired hands. Aesop's unique hand balm relies on a greaseless base formulation to resurrect even the most harshly treated, rough skin. Cuticles and nails too are nourished and revived with this soothing balm. Presented in a generous 500ml dispenser, there is every reason to let your feet also feel the benefit of Aesop's moisturising magic.